If you frequently need people to pick you up from locations whose address you’re unable to provide yourself, and you own an iPhone and can successfully operate it when you’re in those particular situations, then I suppose Dad’s Taxi could work for you. But honestly, even at $1, this app from iSafeNet is a tough sell. Take Me Home: Once Dad’s Taxi determines your location, you can e-mail it or send it via SMS to your ride. When you launch Dad’s Taxi, there’s pretty much just one key action to take: Shake. When you shake your iPhone, the app begins to determine your current location. In my testing, the app (which requires an iPhone 3G and 3GS to work, according to its App Store page) did a fine job of finding my precise location, although it often needed a full 30 seconds to do so. 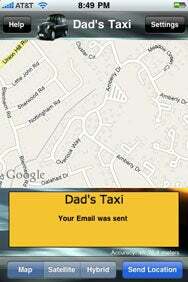 Once Dad’s Taxi finishes figuring out precisely where you are, you can tap to SMS or e-mail your location. That’s pretty much the full feature set of Dad’s Taxi. And indeed, it works. But I’m still struggling to fathom a real-world scenario where this app is genuinely useful, or where it beats asking someone nearby for the current address, using the Maps app to get a pretty close fix, or simply stepping outside to look at the street signs. But if you frequently need to send on your precise location, and rarely know what it actually is, perhaps Dad’s Taxi would work for you.